Huddersfield have completed the signing of striker Laurent Depoitre from FC Porto for a club-record £3.5m fee. The 28-year-old, who has played once for Belgium, joins on a two-year deal with an option for a further season. Depoitre, who joined Porto from Gent in 2016, is the club's first signing since they won promotion to the Premier League in May. Manager David Wagner said Depoitre, who won the Belgian league with Gent in 2015, was "a proper striker". He added: "He scores goals and is a real worker too, so he will fit the 'Terriers Identity' very well." 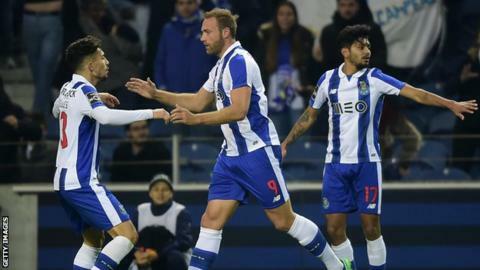 Depoitre played 13 times for Porto in all competitions last season - including one appearance in the Champions League - scoring twice and providing one assist. During his time at Gent, he scored 30 goals in 90 matches and was part of the side that reached the Champions League last 16 in 2016. Huddersfield, who secured their place in next season's top flight with victory over Reading in the Championship play-off final, broke their previous transfer record in June 2016 when they signed defender Christopher Schindler from TSV 1860 Munich for £1.8m. They are set to break it again when Australia midfielder Aaron Mooy's move from Manchester City goes through, with the two clubs having agreed a £10m deal.